Good news for bikers! 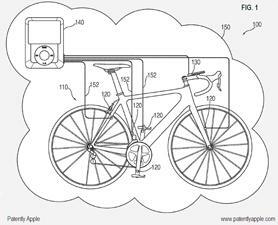 Apple had recently filed a patent for a smart bicycle that will use your iPod or your iPhone to monitor data about the rider according to a report from Patently Apple. This new patent says that the iPod or the iPhone will link up to the bike and can measure speed, distance, heart rate and many other stats including wind speeds. The new concept bike is being called the iBike. The patent also says that the bike will also have Wi-Fi to enable communication between bikers. Apple also seems to wanting to revolutionize the technology and leap ahead of everyone. The bike will be voice-activated and will respond to desired commands. All this will be packed and will be conveniently displayed to the biker on an LCD screen. Speculation is that the entire bike might be made out of liquid metal! Apple has recently signed an exclusive contract with Liquidmetal Technologies to use the technology for consumer electronics. Liquidmetal technologies has developed a metal that has an atomic structure resembling glass more than metal. The plus side of the liquid metal bike is that it requires very little machining and doesn’t need to polished however it is extremely strong and resists corrosion. The bike is expected to be very expensive considering the liquid metal aspect of it. The liquid metal alloy is made from rare materials like beryllium or platinum which are equally expensive. There is not much info on when the bike will enter production or when it will be launched. While this all sounds great, the iBike can also track you on the GPS system that we suspect it will come with. Has Apple thought of privacy issues that this might create? Apple working on Point-of-Sale System for iPhone!